We served this summer-time indulgence to friends this weekend and they were gobbled up in a blink of an eye! Obviously frying them takes away from the delicate flavour so distinctive of these flowers, but as we all know frying is just like bacon, it just makes everything even tastier. Sadly these beautiful golden blossoms do not stay fresh for too long after they are picked, and will wilt within a day. If eaten the day of the purchase it will be easy for you to stuff them, but if you wait any longer the flower petals will wilt and it will be difficult to open them to stuff the flowers. In this case you can just fry them without stuffing them, which is also very delicious. However in this house, we prefer the fried stuffed version where mozzarella cheese oozes out of them! 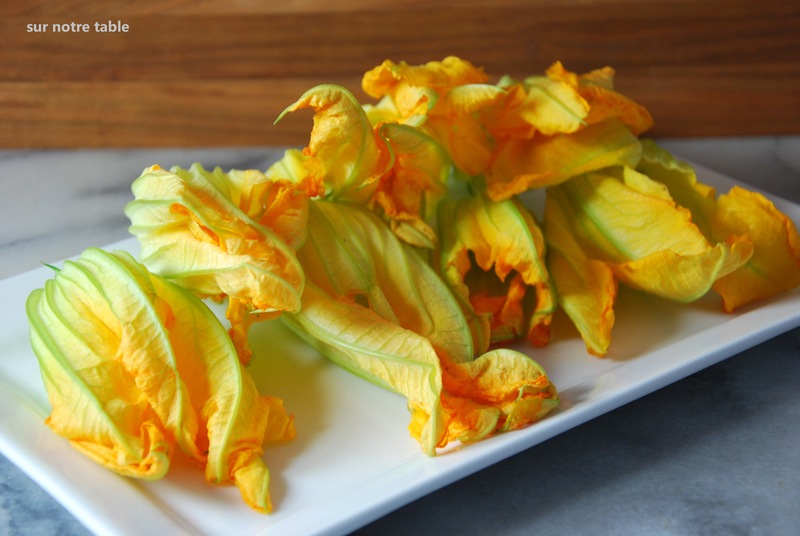 The recipe below, which has been adapted from a William-Sonoma recipe, is based on the traditional Roman recipe, which recommends using mozzarella cheese to stuff the zucchini blossoms. However since the typical mozzarella found at the grocery store can sometimes lack in taste, we chose to stuff them with mozzarella de bufala instead, which is a little more creamier. The anchovies also add the characteristic saltiness to make it even more flavourful. Before stuffing zucchini flowers you must remove the pistils or filaments which are found inside the flower However it’s a little tricky to remove the pistils without damaging the flower petals and therefore I recommend that you do this as soon as you get home with the zucchini flowers before the petals begin to wilt. If not the flower petals will stick together which will make it difficult to reach in the flower and pinch off the pistils. Once the pistils are removed you can then stuff the blossoms shortly before you are ready to fry them. To make the batter, mix the flour and the 1 teaspoon of salt in a small bowl. Add the eggs, sparking water and 1 tablespoon of oil to the flour mix and whisk until well blended. Cut the mozzarella ball into sticks which are about 1 inch long and ½ wide. Pat the anchovies dry with paper towels and cut each fillet into fours. You can fry the zucchini blossoms in a deep fat fryer if you have one or otherwise you can just as easily fry them in a heavy and high fry pan that is about 3 inches deep. In either case heat the oil to 375oF. You will also need to heat oven to 175oF so you can keep the fried zucchini flowers warm as you fry the others. While the oil is heating, gently spread open the petals of each flower and insert a piece of the cheese and a piece of anchovy into each flower and press the petals closed. Once the flowers are stuffed, dip the flowers one at a time into the batter to coat the flower completely. Lift out and let the excess drip back into the bowl. As this can get quite messy it’s best to dip all the flowers and then fry them. 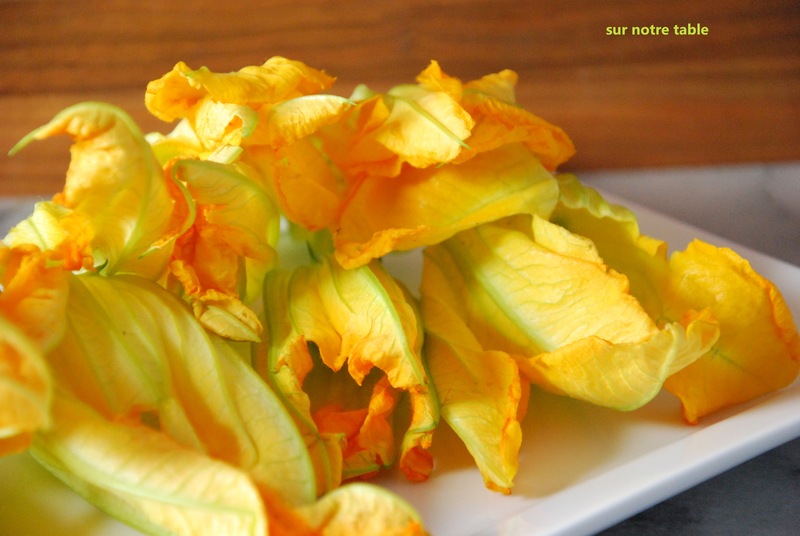 I usually just place a sheet of parchment paper on the counter and lay the battered blossoms on the paper before I put them in the deep fryer or the frying pan. Once the oil is heated through you can then slip the battered flowers into the hot oil and fry until golden brown on all sides for about 4 minutes. In the deep fat fryer turn them halfway through so they can brown on all sides. Afterwards use tongs or a slotted spoon to transfer them to a paper towel on top of a plate to drain. Season with fleur de sel and then place in the oven while you fry the remainder of the flowers. Then serve immediately as is and enjoy! 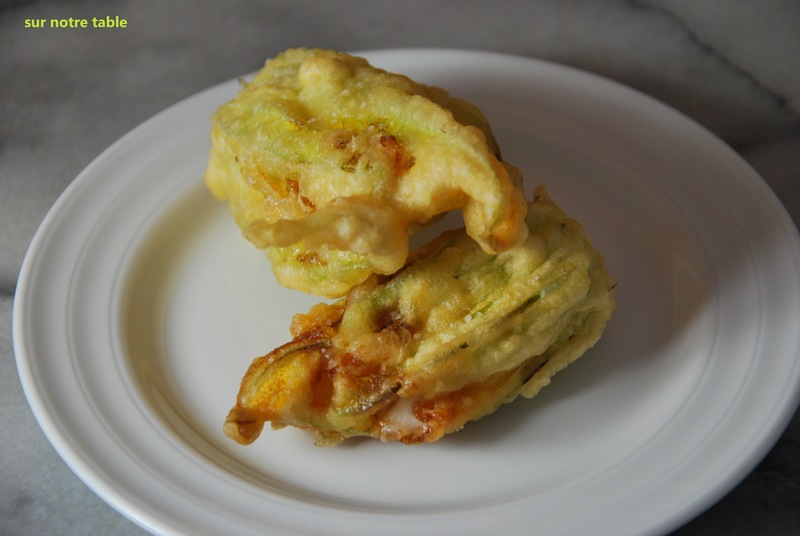 This entry was posted in Appetizer, Easy, Tapas, Vegetarian and tagged appetizer, easy, fast, fried, mozzarella di bufala, tapas, vegetarian, zucchini blossoms, zucchini flowers by Caroline Reny. Bookmark the permalink.